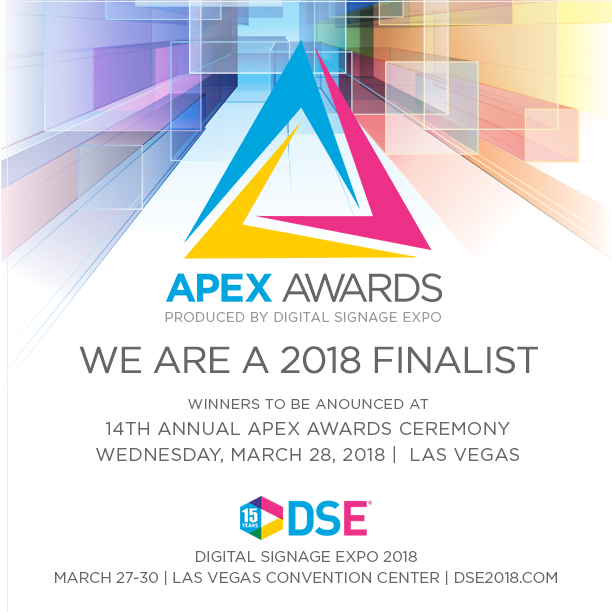 Visix, Inc. has been named a finalist in the Digital Signage Expo (DSE) 2018 APEX Awards in the Education and Healthcare category for its work at Georgia State University (GSU). ATLANTA, GA, February 20, 2018 /24-7PressRelease/ — Visix, Inc. has been named a finalist in the Digital Signage Expo (DSE) 2018 APEX Awards in the Education and Healthcare category for its work at Georgia State University (GSU). GSU has six campuses throughout metro Atlanta with approximately 55,000 students and 2,800 faculty and staff. They partnered with Visix to install and deploy an enterprise digital signage solution to inform students, faculty, staff, and visitors about the university, specific departments, events and more. The deployment is licensed for more than 300 media players, interactive room signs and electronic-paper signs to deliver communications to its target audiences. The results of this expansive signage deployment have exceeded expectations by reducing campus-wide poster printing costs by more than 40 percent. Centralized control of media and playback devices has enabled a dedicated champion to expand campus-wide adoption 200 percent in two years and provided the university with the necessary leverage to lock in a site license saving tens of thousands of dollars in annual fees. The DSE APEX Awards were created to recognize and honor achievement in the installation of digital displays and interactive technology and the creation of compelling viewer content. This year’s APEX Award finalists were chosen by an independent panel of 11 industry experts and journalists from a field of 116 entrants from 10 countries vying in nine major digital signage categories. Gold, Silver and Bronze awards will be presented in each category as part of the Free Networking Reception and APEX Awards Ceremony Wednesday, March 28, from 5 p.m. to 7 p.m., staged at the Renaissance Hotel in Las Vegas. DSE will also present the APEX Installation and Content of the Year Awards to two of the Gold winners. Visix, Inc. designs, develops and supports a suite of browser-based digital signage products that allows users to create, manage and schedule organizational communications from anywhere and to deliver messages, media and alerts to virtually any endpoint. The company offers digital signage software, award-winning content design, meeting room signs, and applications for targeted messaging to desktops and personal devices. Learn more about Visix digital signage products and services at www.visix.com.